To me, each WordARound card comes with its own special "reading motor." Read on to find out more why I think a child who struggles with reading can be helped by games that require more movement from the child. GIVEAWAY: Sensational Package of Both WordARound and Laser Maze will go to ONE very lucky winner!!! Number 1 Son is a born problem-solver. Even though he dislikes it when things get a bit challenging, there is a big part of him that loves solving puzzles, completing mazes, and doing stunts that require physical agility. It's really hard to figure out which challenges he'll take on and which will overwhelm him. But I find that for him, when he walks away from difficult tasks, the only way to get him to do it is to make it even more difficult. Have you ever seen your kids insist on doing something "the hard way?" When your kid does push-ups, does your kid try to do them with one-hand only? If so, I think I know what your child's true enemy is: boredom. Being slow is tedious, being detailed is painful, and being rote is maddening. It's easy to play. When someone wins, they get to keep the card. On the back, you'll see a color swirl. 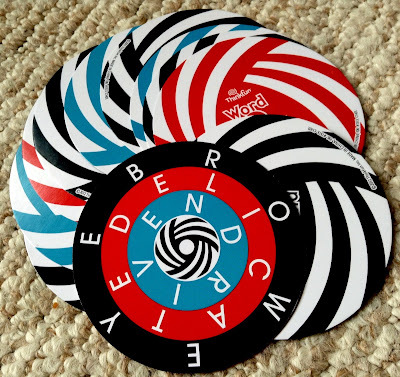 The next ring within the circle to be read will match the color of the swirl on the back of the previously won card. 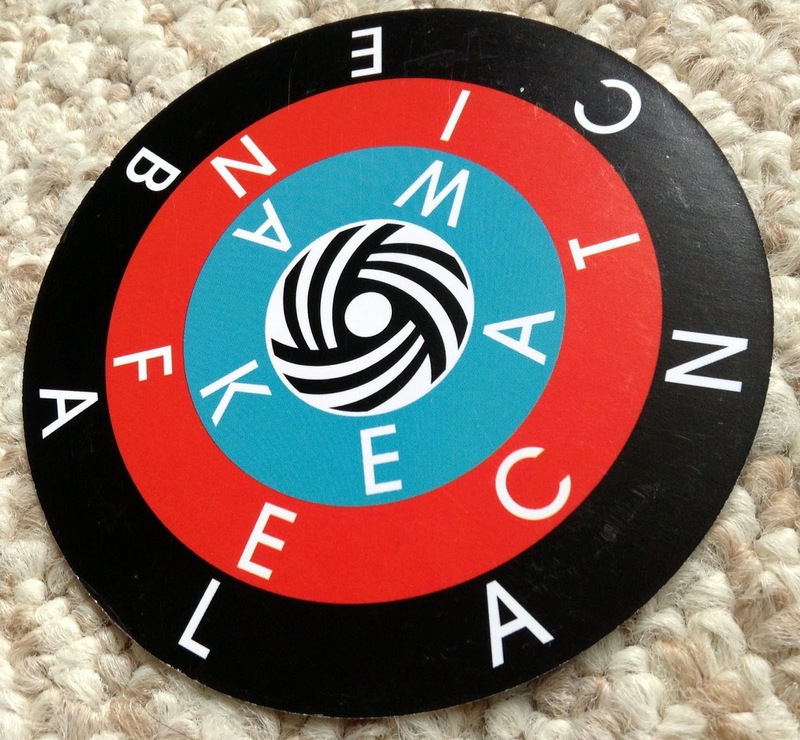 Guess the word first and you get to keep the card. Winner is the person with the most cards at the end of a round. I think my son finds reading to be this way (so do I). It's so hard to be really engaged. He is not a fast reader and that bugs the hell out of him. So what is a mother to do? Reading is important and he was falling more and more behind. I tried so many things and of course, I looked to my Toy-Toolbox to help me. Not surprisingly, I found support from a ThinkFun game. Like all great games, it is appealing to both the very capable to the very challenged. But how can that be, you ask? It's simple really, ThinkFun's WordARound makes reading a blast. You won't know if they word needs to be read clockwise or counterclockwise. Dr. John Ferrera, an educational psychologist looked at WordARound with me because I had a feeling that this game would be very special to children with reading issues. He explained how a child with a reading disability is challenged. "When they read a word, especially a big word, their tendency is to decode the beginning and the end and fill in the middle." He also added that some kids will just read the beginning and guess at the last part. Oh, I've seen a million times. Why John? Why is this happening? "It could be because they are impulsive," he said, "The way to fix that is to prompt them to look at the whole word." John advised that the child be asked to read all the letters in that word. 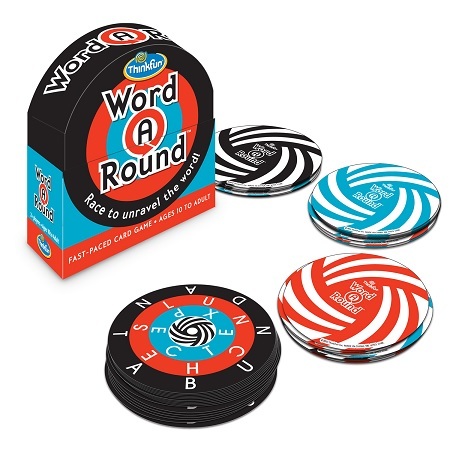 And that is why he likes WordARound because you have one word in each ring of a card and the player will not know if the read should be read clockwise or counter-clockwise. They also don't know the beginning and the end of the word so it asks the player to keep sounding out all the combinations until you get the correct word. "I like that it forces them to do that," John said. "You can’t see the whole word at once." 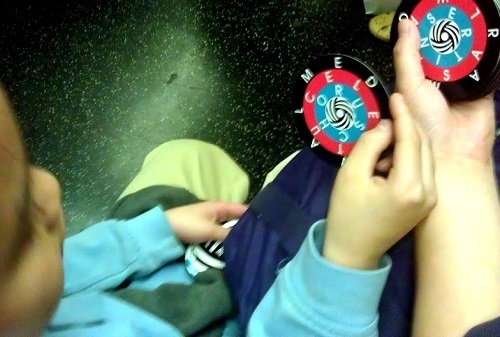 In the subway playing WordARound, the only reading activity in a moving car that didn't give him motion sickness. Like with the one-handed push-up, walking while balancing a book, or doing a 180 on a skateboard vs. just going for a ride, some kids love a challenge, especially a physical one. In the case of WordARound, you are being asked to move some muscles., specifically, your eye muscles. Because there is competition to read the word first, you have to move those muscles and start reading fast. I also discussed this game with Karin Buitendag, Pediatric Occupational Therapist, Director, Occupational Therapy, STAR Center (Sensory Therapies and Research Center) which is recognized as a global leader in the field of sensory processing disorder. I asked Karen about movement and reading and told her how my son really enjoyed WordARound despite his difficulty in decoding. I was so surprised by his success. So was he! Karin then mentioned something called vestibulo-ocular reflex which is linked to the vestibular system which Karin described as one's sense of movement. Thank you Wikipedia! Caption: The vestibulo-ocular reflex. 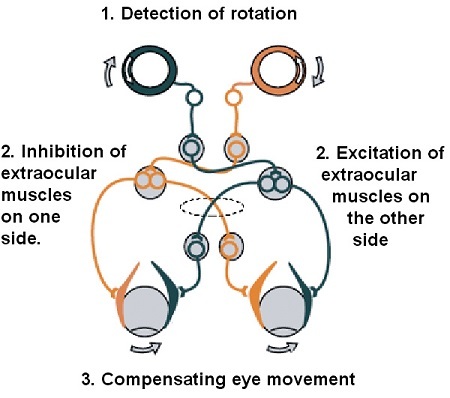 A rotation of the head is detected, which triggers an inhibitory signal to the extraocular muscles on one side and an excitatory signal to the muscles on the other side. The result is a compensatory movement of the eyes. Plain talk translation: To stabilize your vision, when you turn to the left, your eyes move to the right. When Karin said that I felt like every single star in the sky was shining on me. Oftentimes, I find that any language arts difficulties are diminished when he gets to move. I know that he is a kinesthetic learner and all but that still doesn't mean I know exactly how his brain works. But after describing my son to Karin (pause: how lucky am I? ), I asked her if she could maybe think of why kids like my son read better when their eyes and sometimes even their hands are required to move more. "If there's more movement, he gets better feedback," said Karin. "And that helps him to direct his focus." Karin further added that he is able to direct not just his focus but also his senses and that because of movement, his cognitive process work more efficiently. She then went on to describe the connection between our sense of movement and interhemispheric communication (both sides of the brain talking to each other). Reading requires one to use both hemispheres. Did you know that? I did not. One thing I do know about the vestibular system is that it is super important to one's daily functioning. If your system is off, you can become so dizzy that you can just fall over just by closing your eyes. He grabbed this immediately and just started reading. But now that I can make this, I wonder if I can put homework reading into these little pages. I started to test this idea of movement and reading more and so I found this program that turns text into spirals and other shapes. I think most others would think that reading this way is laborious but if my son had use more muscles and movement to read more accurately then maybe this program could help. He stood there turning his paper around and around. At one point, as he got closer to the center, he stopped turning the page around. Instead he just started reading the words upside down. This was actually easier for him. The results were unbelievable. 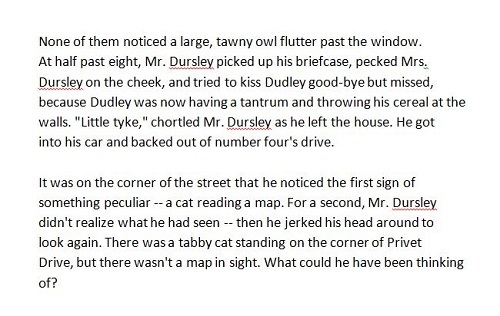 I cut and pasted a passage from Harry Potter into a heart shape and he started reading it immediately. No fuss, no refusal. There was so much more fluency. He stood there turning the page around and around reading Harry Potter, the series that he loves to listen to thanks to Learning Ally. Then I printed the next paragraph in a spiral and I swear, both of us got goose bumps. He never... not once... ever.... lost his place on the page which is unfortunately a frequent occurrence for him. Then I gave him a page that was printed in horizontal lines but he just refused that altogether. When asked why, he told me circles are more fun, rectangles are boring. 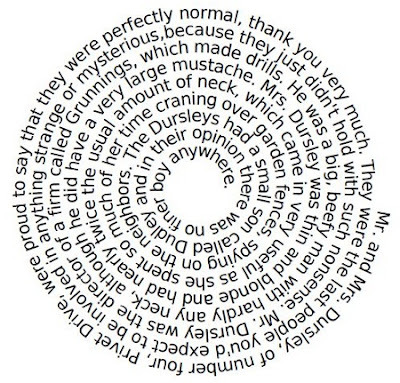 But clearly, you'd think the circular reading would be harder but not for some. I have to agree, the spiral and heart are a lot more exciting than this rectangle. We tested WordARound with kids with strong reading skills, including our fashionista, Number 5 who is a huge fan of the Hunger Games. Her family had great fun with WordARound. Our family definitely had fun with WordARound but one thing that was tough to figure out was how to keep the competitive spirit when one person is clearly more skilled in reading than the other. In that case, you can opt to do what I did. Give the child a 30 second head start. John also agreed that this could be a good way to go. I also asked John if he would like to see WordARound come out as some sort of app version where one can input their own choice vocabulary words or spelling words to support their curriculum. "YES!" he said with great enthusiasm. I don't know of such an app yet but I will be first in line to download such an amazing way to use games to incorporate tasks like homework and studying for exams. In the meantime, I can just enjoy trying to read the 300 words in the 100 cards of this game. I am hoping for a sequel pack to come out. Even if they don't include this week's spelling test words, as John put it, WordARound allows you to practice the mechanics of reading. Just like in a book, you never know which words you'll get and that is a huge part of the fun in reading. My play idea! Triple WordARound! Who can say three words (one per circle) the fastest? MSRP for Laser Maze $30 so don't miss out on the chance for winning. Small off-the-record hint for you: it will be an AWESOME review. This expert who is working with me on this has very very high standards and he loves this game! 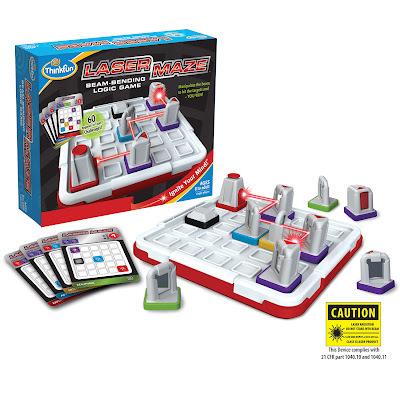 And now try out to win this fabulous DUO Games Package of WordARound and Laser Maze!!! Toys Are Tools Would Like to Wish All Families the Best Start to a New School Year! Stick with us this fall to learn more about my awesome toy/tool finds to support academic success! Want to get WordARound or Laser Maze on Amazon? Use Amazon links to support Toys are Tools - or bookmark this link whenever you want to shop on Amazon to support me! Together we can continue thoughtful toy reviews to see another playful year! Super Duper Book Recommendation about People with Dyslexia - their strengths and challenges. I love this book. Also, if you have a reading disability in your family, get them Learning Ally!!! You must must must. It's a testament to how civilized our society truly is. A low membership fee allows you to have access to over 75,000 titles on audiobooks! Audiobooks are no longer a luxury buy! I love Learning Ally! Disclosure: Toys are Tools was not compensated by the manufacturer for the publication of this review. The reviewed items were provided to Toys are Tools and the experts to facilitate a review. Reviews are never promised. The giveaway prize is being offered by the manufacturer. Best reading tip is to just find books on subjects the child likes. The AHA! Brainteaser Kit looks like fun. I'm thinking that, individually packaged, they would be great to take along to a restaurant or doctor's office. The solitaire chess - my son has that app and it is so much fun! Continue to read aloud to children even after they are able to read themselves. With my grandchildren we have a rule that they have to read for at least 30 minutes every day before they can play any video games. Usually this means they read just after waking up or immediately after breakfast because they really want to play their video games. This works well for us since the GCs only stay with us during summer or school breaks and we don't have to deal with getting ready for school or homework issues. The AHA! Brainteaser kit appeals to me because it features concrete, 3D examples of abstract visual-spatial concepts. I think it would be a great collaborative effort between friends or siblings. Great article! 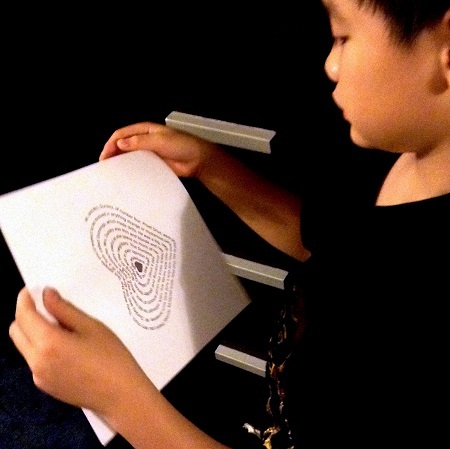 My 9 year old son is also a kinesthetic learner and sensory seeker --- and is amazing at WordARound, loves it! He’s impulsive and gets bored easily with typical play, so perhaps it feeds his desire for movement and input like your studies suggest. For example, he looks for ways to make learning fun like hanging upside down for writing assignments. Drives me a bit, crazy but effective for his needs I guess. .. So your studies ring true to me. Especially Karin’s comments below. to direct not just his focus but also his senses and that because of movement, his cognitive process work more efficiently. She then went on to describe the connection between our sense of movement and interhemispheric communication (both sides of the brain talking to each other). Reading requires one to use both hemispheres. Did you know that? I did not. One thing I do know about the vestibular system is that it is super important to one's daily functioning. If your system is off, you can become so dizzy that you can just fall over just by closing your eyes. Thanks again for your input. So very insightful! John, Totally agree with you there. The trouble is always trying to find high interest books that are easy enough. This is why I love Learning Ally!! Thanks for checking that out! I think that kit looks awesome! I thought I knew everything that ThinkFun has to offer and lo and behold, there goes a kit that I have never seen before. I love it. I would call it the keep-out-of-trouble kit because smart brains sometimes need to be teased to stay out of trouble, right? I know what you mean. I remember my fifth grade teacher read a book to us about a town of kids that had no grown ups because the grown-ups disappeared one day. (I think). I wish I could find that book again.. I think it was called Our Town? I haven't a clue. Maybe you know... I tried looking for it but couldn't remember... Nevertheless it was fifth grade and certainly I was able to read but having my teacher read us that story is still a well-cherished memory for me. Wow, this seems to be the big winner today... I have not reviewed enough brainteasers here. They kind of scare me. While I definitely did research, I must confess that I am no scientist. I am just a mom with a hunch. I gather there must be evidence based practices somewhere but I have a feeling that it is not heavily researched and that is a shame because seeing my kid read on a spiral like that was simply insane. It was so much more fluid! I think it is totally cool that your son is amazing at this game. Who says words need to be written on a straight line. A long time ago, East Asians wrote vertically. Imagine if we did that now. It would look crazy but there is no reason that it really would be. And I am making a pact to NOT let homework bring drama home. I refuse to let it. Reading tip? I would say, read to children from day one while nursing them. Have one of their favorite book with you at all time so you can read to them whenever there is a chance. Have them help you pick the books at the library and engage them when reading by asking questions and above all, make it fun. I love the idea of a Swish Jr where one has to learn to move the cards into their minds. It sounds like a lot of fun for the family after dinner. You are amazing. Thank you soooo much. You answered a 30 year mystery for me. Let your child find books that interest them. Reading should not be a forced or bad experience. We do story themes at home and sometimes choose books that have a coordinating movie we can watch after reading it. I like the hello sunshine game for young children because it looks fun and engaging. Reading Tip, after cleaning up and readying my daughter for Bed we read every night (laying in bed)for 15-20 min while in bed and it helps her reading ability as well as helps to wind her down for sleep.